Le Club AccorHotels has launched a double points offer for stays in Sao Paulo state (Brazil) between November 1 – December 31, 2016. The offer is valid for stays at Novotel, Mercure and Adagio brands when booked November 1 – 30. It is really unbelievable how many ongoing promotions Le Club AccorHotels has all over the world. 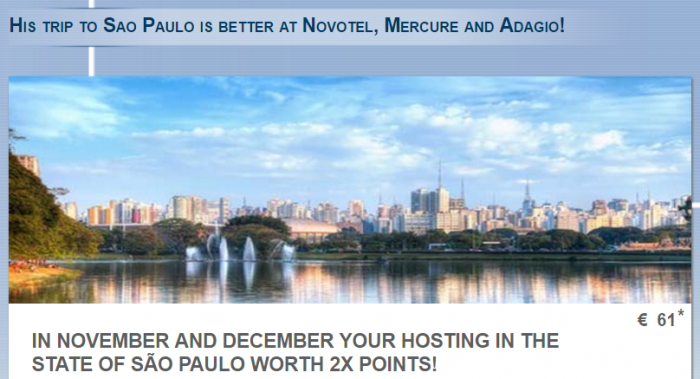 This is an opportunity for those staying in Sao Paulo state before the end of the year to earn double points. 1. The terms and conditions Le Club Accorhotels apply to offer his trip to Sao Paulo is better at Novotel, Mercure and Adagio!And to enjoy it must be associated with Le Club Accorhotels. 2. This offer allows members Le Club Accorhotels, regardless of their status, benefit from the accumulation of bonus points x2 for lodging in one of the hotels participating in the loyalty program Le Club Accorhotels. This promotion does not apply to partner hotels Le Club Accorhotels . the number of bonus points for this offer is calculated according to the points earned by the member with Classic status. 3. This offer is valid for hosting an associate of 01/11/2016 to 31/12/2016 in a participating hotel, which has been booked between 11.01.2016 and 30.11.2016 . 5. Any consecutive accommodation (check-out and check-in on the same day) at the same hotel will be considered as one stay.This unique lodging once will be valid for offering his trip to Sao Paulo is better at Novotel, Mercure and Adagio! . 7. To use this offer, your reservation must be made in AccorHotels.com, websites and applications of the participating brands and Call Centers accorhotels. Any other reservation channels will not be eligible for this offer. 8. Should indicate the number of your loyalty Le Club Accorhotels card when booking and present your card at the front desk at check-in hosting. 12. This offer is subject to availability. Are applied the terms and conditions of sale for reserved public rates of each hotel. you must subscribe to the offer Your trip to Sao Paulo is better at Novotel, Mercure and Adagio! Before you make a reservation for able to participate in the offer.